On Monday 7 July, a court in the Chechen town of Urus Martan, found Ruslan Kutayev guilty of unlawfully procuring and possessing heroin with no intent to sell; and sentenced him to four years in a minimum-security labour camp. 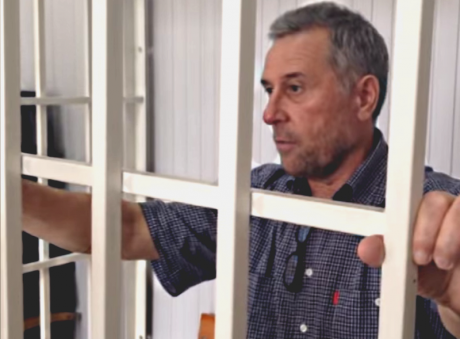 Presiding judge Aleksander Dubkov also banned the 56-year-old president of the NGO 'Assembly of Peoples of the Caucasus,' and member of the political council of the 'Alliance of Greens and Social-Democrats,' from engaging in any public activity for a year after the end of his sentence. Ruslan Kutayev was arrested on 20 February 2014, outside the house of relatives, in the hamlet of Gekhi. According to the Interior Ministry, a crime-prevention operation was being run at the time in the village, and the patrol detained Kutayev, whose behaviour struck them as 'odd.' When they searched him, they found three grammes of an unknown powder substance in his trouser pocket. Kutayev was taken in for further investigation. 'For a long time we didn't know where Ruslan was, who had taken him, and where,’ said his brother Shirvani. ‘We only knew he had been arrested outside our relatives' house, in his slippers – they were just sitting down to supper. Several cars drove into the courtyard; then masked men came in to the house and took my brother away. It was only late that night that we discovered he was at the police station at Urus Martan,' Later, the investigators informed him that Kutayev had confessed to possessing heroin. A day after that, he was taken for medical testing. After several attempts, they apparently found codeine and morphine in his urine. His brother managed to get to see Ruslan when he was in the police station: 'he had broken ribs and had been badly beaten. He seemed very low.' Later, in March, the doctors discovered that Kutayev had two broken ribs and the lawyers recorded many bruises, a large hematoma on his back and in the chest area. Relatives are in no doubt that the officers had beaten Kutayev, to try and get him to confess, though he denied this at the bail hearing on 24 February. Kutayev confessed that he had found the package with the three grammes of heroin in a taxi on the way back from Pyatigorsk, and had put it in his pocket quite consciously. The anniversary of the deportation of Chechens was moved to 10 May, the anniversary of former President Kadyrov's (left) burial.Kutayev's arrest did not cause much of a stir in the Chechen Republic; it did, however, attract the attention of Russian human rights campaigners. Igor Kalyapin, head of the Committee against Torture, was the first to publicise the charges against Kutayev. He pointed out that two days before the arrest, Kutayev, among others, had taken part in an adademic conference in Grozny's Central Library. This was to commemorate the 70th anniversary of the deportation of Chechens and Ingush; other participants included Chechen WWII veterans, Deputies of the republican parliament, academics and historians. The anniversary is usually commemorated on 23 February, but this year, President Kadyrov decreed that the date should be changed to 10 May, the anniversary of the burial of his father Akhmad Kadyrov. Ignoring the decision of the Chechen President, Kutayev convened an academic conference on 18 February. Ignoring the decision of the Chechen President, Kutayev convened the conference on 18 February, and, in so doing, according to Kalyapin, fell foul of the head of the Presidential Administration, Magomed Daudov. Several of the people involved in the conference were called to a meeting with Daudov, who expressed his dissatisfaction at what had taken place. Kutayev was telephoned and 'invited' to attend, but refused, saying that he did not have to take orders from the head of the Presidential Administration; and he was too busy to attend. 'After the conference, Ruslan rang me and several others in Moscow. He was sure he would be arrested quite soon because of his refusal to meet Daudov, said Kalyapin. ‘He called me from his relatives in the village to say he was being followed. Two hours later he had been arrested.' Soon after the arrest, Kalyapin managed to get to see Kutayev in the Urus-Martan police station, where he confirmed the many hematomas and bruises on Kutayev's body. Kalyapin's preliminary investigations led him to declare that the case was politically motivated and the charges trumped up. 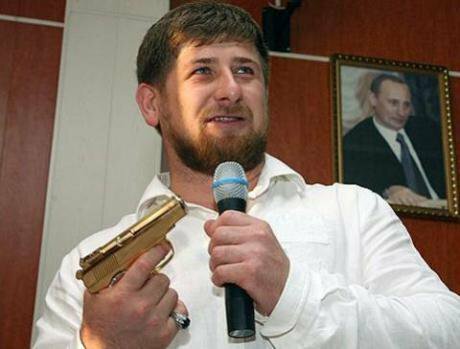 The Chechen leader, Ramzan Kadyrov, reacted very quickly to this statement: at a meeting in the Public Chamber he stated in his usual brusque manner that Kalyapin was involved in dubious financial dealings and even in aiding and abetting terrorist activities in the republic. ‘Some people in Chechnya are trying to make a career out of human rights and have their own agenda,' said President Kadyrov. This is not the first time that Kadyrov has attacked Kalyapin and his committee, criticising him and it for offering legal assistance to victims of torture, which they have been doing since 1995. 'We have our own human rights campaigners, who can raise any questions with the Government and defend the legal rights of Chechen citizens; they have no need of any Kalyapins,' was the conclusion of the President. The next person to speak of the Kutayev case was the Chechen Ombudsman Nurdi Nukhazhiyev. He explained that as soon as he heard about Kutayev's arrest, he tasked his subordinates with discovering both the circumstances and the reason for the detention. He said he had spoken to Kutayev alone, and could reveal that the prisoner had no complaints about his rights being infringed or the conditions of his detention. 'I can see no reason for getting excited about this case, but those that are making the fuss are certainly working against Kutayev's interests. The situation is being artificially hyped by some people who are pretending to be energetically engaged in human rights activities, but are really only interested in self-promotion,' said Nukhazhiyev. He undertook to keep tabs on the investigation, and to react immediately if he considered this to be necessary. 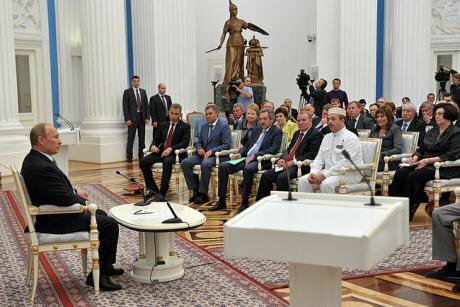 Dressed in white, Chechen Ombudsman Nurdi Nukhazhiyev (far right) attends a session with Putin on human rights in Russia. The investigation of the charges against Kutayev was completed fairly rapidly: the investigators only took two months to prepare the indictment, and on 25 April the trial began. The police who had taken part in his arrest were called as witnesses. During the trial, Igor Kalyapin more than once pointed out the inconsistencies and contradictions in their evidence. One of the witnesses said that Kutayev had attracted their attention because he was 'unsteady on his feet, though standing in one place, and in some kind of agitation.' This led the officers to suspect that he was on drugs. However, Kutayev was only taken for medical examination the day after he was arrested. Kalyapin's suspicions were also aroused by the fact that during questioning many of the policemen asked the judge to read out to them the statements they had made earlier, during the investigation. The policemen asked the judge to read out to them the statements they had made earlier. On 2 June, while on the stand, the neurologist who had examined Kutayev, said that she did not know who had entered into her signed statement the ‘fact’ that codeine and morphine had been found in his urine. She said that she had made no probe sampling for analysis, and that she herself had not been in charge of the laboratory investigation; who had done it and when she did not know. Kutayev himself explained at the trial that he had been compelled to confess under torture. 'I was taken to Daudov. He and Alaudinov (Deputy Interior Minister) beat me viciously in the presence of their bodyguards,' said Kutayev, during one of the court sessions, 'I don't think this was only personal animosity towards me, however, and it is by no means the main reason for the fabrication of criminal charges and the subsequent criminal proceedings.' In his opinion the case against him is only one of the many examples of Russian officials and siloviki (officers from the uniformed ministries) settling scores with their political opponents in Russia. Magomed Daudov, head of the Presidential Administration, is well known in Chechnya as a former soldier with the codename 'Lord.' Two weeks before the trial, he expressed his intention of personally attending it. 'I heard that during the last session my name gave rise to laughter. I am not working in a circus, and therefore do not take kindly to anyone ridiculing my name.' He stressed that he had neither beaten Kutayev nor detained him. He also assured the judge that he was not personally acquainted with the defendant, had never met him and, contrary to what the defence had said, had only spoken with him once on the telephone. Daudov even asked the court to show mercy towards the accused on the grounds that anyone can make a mistake. In Russia, the penalty for possession of drugs in large quantities without intent to sell is from three to ten years. The prosecution called for Kutayev to be given five years. The court sentence was four years in a prison camp. Kutayev's arrest has attracted the attention of human rights campaigners inside Russia and abroad. In Russia, the human rights watchdog 'Memorial' designated Ruslan Kutayev a political prisoner. Memorial is sure that the case bears all the hallmarks of falsification: their suspicions were aroused, among other things, by the evidence of the policemen during the trial. Interior Ministry officials were unable to explain where the order had come from to carry out a crime-prevention operation in the village of Gekhi; and no documents on this subject were made available to the court. Novaya Gazeta journalist Yelena Milashina, who has been following the case, regards the Kutayev case as the first political trial in today's Chechnya. 'I was present at practically every session of the trial in Grozny, and I am absolutely convinced that the legal investigation was falsified from start to finish. The barrister for Kutayev completely demolished all the accusations against him, although the court totally ignored his conclusions, thus only emphasising the weakness of the verdict.' She is sure that Daudov attended the trial of his own volition solely with the intention of scaring everyone involved, and demonstrating his strength. 'It's the first time that such a high-ranking silovik (bureaucrat) has wanted to be called as a witness at a trial. All the better – now his surname will remind everyone of the scandalous sentence imposed on Kutayev,' she says. His relatives and friends point out the inconsistency of the charge against him – he could not bear cigarettes or alcohol, so how much more intolerant would he have been of drugs? He couldn't bear cigarettes or alcohol, so how much more intolerant would he have been of drugs. It is important to remember that there was no criminal episode, as Igor Kalyapin points out. 'No one found heroin on Kutayev because he was not searched; he was detained at home by armed men. All the documentation materialised later on. We tried to prove this in court. We had only to ask for the phone records of the policemen who apparently arrested him but who were not actually in Gekhi on that day; and, indeed, Kutayev's own records, to see that he hadn't been to Pyatigorsk that day. So he didn't come back in a taxi and didn't find a package,' says Kalyapin. Notwithstanding, he considers that the chances of the appeal court finding in favour of Kutayev, and reducing the sentence are virtually nil.